Greg House. . HD Wallpaper and background images in the TV Male Characters club tagged: gregory house house md stills hugh laurie season 2. 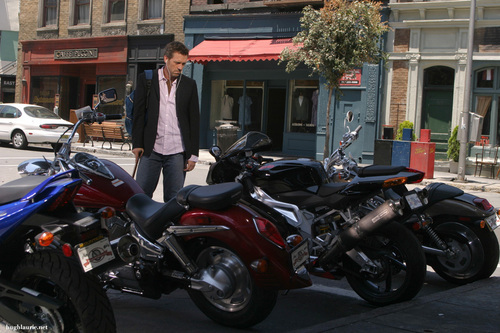 This TV Male Characters photo contains policial de moto, o policial de motocicleta, bobina de velocidade, policial de motocicleta, policial de velocidade, motocicleta policial, lambreta, scooter scooter, motoneta, scooter, and motociclismo. There might also be motocicleta, bicicleta, moto, motociclista, and ciclomotor.